College archivists need to have a good understanding of their collections as a whole, and a long term view of what needs doing to and for them, but our work is usually concerned with specific issues such as records of an individual Old Member, an event or a college living. We tend to produce short, more or less unconnected pieces of research that contribute to the work of others; it’s rare that we have time to step back and look at our own work on a more general or theoretical level. An invitation to speak to the Sorbonne’s CIMER course theme of intercultural communication, for which I presented the original version of this article, offered an opportunity to examine what I do through a new lens, looking at the numerous demographics for whom I interpret Balliol’s archives and manuscripts. The usual social science definition of intercultural communication has to do with national boundaries, geographical distance, ethnic background, and language. Rarer examples include factors more relevant to my work such as different education systems or generations. Differences in language and geographical or ethnic culture are generally allowed for and expected in enquiries about the archives; more likely to need explanation are cultural differences across time – generations and even centuries – social class and levels of education. And the most important, most frequent and often most difficult differences to understand are cultural and linguistic ones between Balliol, Oxford and the rest of the world. As the college archivist, my responsibilities fall into two categories: to ensure that the archives and manuscripts survive for future generations in at least as good a condition as they are in now, and to make both the original manuscripts and information about them as widely accessible as possible. My priorities are to fulfil these two responsibilities to several very different audiences: the current college administration, members of Balliol past and present, and the wider community of researchers with specific interests ranging from medieval history to modern architecture and including many family and local historians. I receive an average of 500-600 enquiries every year; about 70% are from outside the college, and the vast majority of those concern family history. For the purposes of this article I will concentrate on access – this includes cataloguing, digital photography, answering enquiries, composing presentations of various kinds about the collections both as physical exhibitions and on the Web, and carrying out research on the collections myself in order to be able to explain and interpret them for enquirers. The collections for which I am responsible fall into three distinct but closely related parts. At their core are the institutional archives – the administrative records of the college, going back in some cases to its very beginnings in the 13th century. I also curate the more than three hundred medieval manuscript books and the hundred or so collections of modern personal papers belonging to individual former members of Balliol. So how can the college’s archives and manuscripts play an active part in college life and culture, not just as a dead record of the past? Integrating the archives into different aspects of current college culture – staff, Fellows, students – is an ongoing and interesting task. Current college administration requires perhaps the least ‘cultural’ interpretation of records; as the functions – and the problems – of the college have remained the same, the administrators of today understand very well the kinds of things their predecessors dealt with. There may be differences in how these things are recorded or at what level of detail, or indeed in what language, but basically the core functions have remained the same. I am regularly asked by college officers for building plans, dossiers for individual past members, and just occasionally something quite unusual. From time to time, I am asked why we bother to retain medieval records, and how documents 700 years old can possibly still be relevant. However, we have recently had a forcible reminder that in some cases even our most ancient parchments can still have vital legal importance. Oxford colleges were originally founded as charitable foundations, and in 2008 the Charity Commission requested documentary proof of their original intention and purpose. The college archivists sent digital images, transcriptions and translations – because all the medieval and early modern documents are written in Latin, in the characteristic hand of the day – of our respective foundation charters and other relevant documents. Balliol’s first statutes of 1282 do not mention learning or teaching; rather, they emphasise the requirement for members to pray regularly in chapel for the souls of the founders and benefactors. The purpose of the college was indeed the education of a number of scholars, but that particular function is not mentioned. It is not until 1284 that a charter from the Bishop of Lincoln (D.4.3-4) mentions words such as ‘studying,’ ‘learning,’ ‘lectures’ and ‘graduating’ – this turned out to be a key document in our presentation to the Charity Commission. In the past, most student members of Balliol have had no idea during their time as undergraduates that their college possessed such manuscript treasures. I regularly meet old members who are delighted to learn about the collections, but disappointed that they never knew about them while they were in Oxford. I am making efforts to get students involved – both academically, because in several disciplines some use of original source material is required for the final dissertation, and socially, because some of our best surviving and most interesting classes of records come from the college sport clubs and student societies. Current Boat Club members have enjoyed reading detailed training programmes and race descriptions by rowers in the 1880s, and recent Presidents of the Arnold and Brackenbury Society have investigated lists of past debate topics and speakers, from Lord Curzon to Boris Johnson. 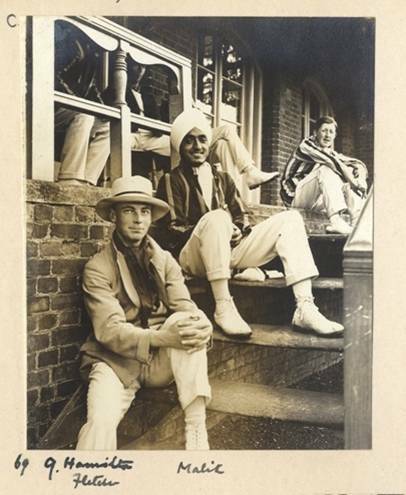 The clubs’ and societies’ photo albums are a gold mine for all sorts of historians. I occasionally speak to student groups about my work and liaise with the JCR, clubs and societies to increase their awareness of their own predecessors’ records in the archives, and their understanding of keeping society records for the next generation. Old Members too have opportunities to encounter archive and manuscript material, at exhibitions during Gaudies or Balliol Society events and through their own enquiries. This kind of interaction is often reciprocal, as old members regularly send deposits of society records and explain to me customs and terms from their own time at Balliol, and are often helpful in identifying places and faces in old photographs. Scholars and academics from around the world are the most obvious sector of my ‘client base’, but their enquiries form a small percentage of my annual correspondence. Most of their research intersects with college records in some very specific way – about an individual, a text in a manuscript, a piece of property. In their area of focus they usually know more than I do, and often what they need from me is not help understanding a manuscript but my more lateral knowledge of the collections and what else we might have that is relevant. Others will sometimes get in touch rather too early in their research, and need guidance to shape their research question, or redirection to other repositories. Amateur historians, mostly family historians working on their own genealogy but also some investigating the history of houses and properties, form more than half of my enquiries every year. As well as substantive information about individual old members or farm leases, responses to these enquiries often include explanations of university slang, legal terminology, translations from medieval Latin and transcriptions of old handwriting. And how do I carry out all this research and make it available to people? Aside from the quotidian correspondence on specific topics with individual enquirers, the traditional intellectual media for interpreting archives to wider audiences are principally the catalogue and the exhibition. A catalogue provides an organised list of the contents of a collection and their relationship to each other, while exhibitions shape features of a collection and provide more context. Digital and online resources of all kinds are now any archivist’s stock in trade. At its most basic a catalogue can still be completed with paper and pencil and sent by post, but these days cataloguing is usually done direct to computer as either a Word document or a database. Many of Balliol’s catalogues of archives and manuscripts are available from our own website and via national online archive networks. A growing number of Oxford college archives (including Balliol) now use AdLib database software for cataloguing, and plans are afoot to produce an AdLib-based online union catalogue analogous to Cambridge’s JANUS project. Exhibitions certainly continue in their traditional format, displaying original manuscripts, often with an accompanying guide and an introductory talk by the curator. While physical exhibitions are open for only a limited time, whether supporting teaching or college events, they now also have a permanent digital afterlife on the archives’ website, which gives a chance to add more images, further information and links to related collections, as well as later updates on the subject. Online resources are overwhelmingly the most effective way to provide information to nearly all the audience groups with an interest in Balliol’s archives and special collections. In contrast to the hundreds of emails that come in, I receive perhaps a dozen letters each year, and reply to at least half of those by email. While they are no replacement for original non-digital documents, and not (yet) reliable in the long term, digital facsimiles of documents, i.e. scans and photographs, are excellent tools for giving free worldwide accessibility and extra functionality to traditional media. Searchability is the most obvious, including image tags and geotagging as well as keyword searching of text. Balliol’s archives and manuscripts collections have active and growing presences on our own website, a WordPress blog, Twitter, Facebook and Flickr. I hope to show in future reports that these resources help to both answer and encourage research enquiries. My primary responsibilities are to the administration and members of the college; however, my correspondence also provides significant outreach to several hundred people every year who have all kinds of misgivings and misconceptions about Oxford’s ‘exclusivity’, and would have no other reason than a family history enquiry to get in touch with the college or the university. I think that some of my enquirers – and not only those from outside Oxford – assume that Oxford college archivists are tweedy old (male) academics, antediluvian in their attitudes and disinclined to be helpful. It takes a certain amount of courage to write to such a (perceived) person, and a courteous professional response can help to break down cultural barriers. This article originated as one section of a lecture to postgraduate students on the Master CIMER (Communication interculturelle et muséologie au sein de l’Europe en reconstruction) programme at the Sorbonne (Paris IV) in March 2011. My thanks are due to Mr. Aleksandar Protic, President of the Sorbonne UNESCO Club, for arranging my visit, and to the course director, Prof. Francis Conte (Hon Fellow of St Antony’s), for his very kind welcome. An illustrated version of the whole lecture is available online at http://balliolarchivist.wordpress.com. Club UNESCO Sorbonne avait un grand plaisir d’inviter et d’accueillir, le 22 mars 2011, en Sorbonne, Ms Anna Sander, chargée des archives et manuscrits de plus ancien collège de l’Université d’Oxford: Balliol’s College. Nous remercions Prof Francis Conte, qui a accueilli Ms Sander et rendu possible son intervention en cours de la Communication interculturelle et muséologie au sein de l’Europe en reconstruction. 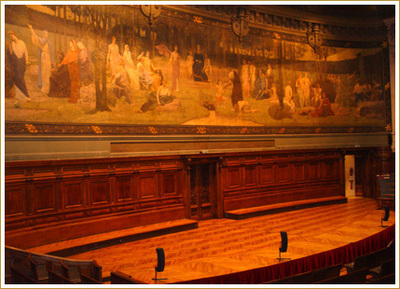 La conférence proposé par Ms Sander « Understanding Ourselves: interpretation of college archives as intercultural communication » s’inscrit dans le travail du Club UNESCO Sorbonne, dans le cadre du programme concernant la diversité culturelle. Un retour aux sources a été entrepris par Le Service de communication du Rectorat de l’Académie de Paris mettant en place une nouvelle identité visuelle pour la Sorbonne. Cette initiative provienne d’une volonté de renforcer un sentiment d’identité réel à l’instar des pratiques des plus grands universités européennes. Le logo en question est le premier sceau de l’université de Paris . Ce sceau de longue date a marqué la création de l’université de Paris. La possession d’un sceau était au Moyen âge, le propre des personnes physiques ou morales. L’université de Paris, établie entre 1205 et 1210, n’a constitué son sceau qu’en 1246. Depuis cette date, elle est devenue une institution entièrement autonome « UNIVERSITATIS MAGISTRORUM ET SCOLARIUM PARISIENSIUM» et une corporation de maîtres et d’étudiants libres de se consacrer à l’étude selon les règles qu’ils se fixaient à eux-mêmes. L’université de Paris et la Sorbonne ont eu des destins parallèles qui se sont croisés très souvent au cours de l’Histoire et ont fini par s’unir en 1821 lorsque l’université de Paris a définitivement pris siège en Sorbonne. Ce sceau symbolise l’ancienneté, la rigueur, la sagesse, le prestige de l’université de Paris et par extension de la Sorbonne. L’original du sceau est actuellement aux archives nationales de Paris. conçu pour des evenements solennels, non pas pour l’enseignement, est avec ses 1.128 places l’une des plus imposante salles de Paris. Grâce à sa construction métallique cachée, il réussit à éviter les piliers gênant la vue. La décoration de cet amphithéatre exigeait un soin particulier : en 1886, Nénot et Gréard proposent aux Beaux-Arts de confier la réalisation d’une grande toile peinte à Pierre Puvis de Chavannes, dont les couleurs claires concorderont avec l’ensemble du décor ; d’abord peu enthousiaste, le peintre réalise finalement l’un de ses chefs-d’oeuvre avec le Bois sacré (esquisse au Salon de 1887, inauguré avec l’amphithéâtre en 1889). Robert de Sorbon et Richelieu, Descartes et Rollin, Pascal et Lavoisier. Les abords du Grand amphithéâtre ont une solennité hors du commun. Avec ses deux volées latérales, le grand escalier obéit à l’idée d’un palais académique.Enfin, une remarquable « République assise » méditative nous est offerte par Delhomme. Cet endroit de prestige, au centre historique de Paris, sert également pour l’organisation de colloques, de conférences ou de spectacles. « Dans le cadre d’une Europe qui se reconstruit à grands pas, les relations entre les deux pôles historiques de notre continent – l’Est et l’Ouest – ont acquis une importance de plus en plus marquée, et notre pays doit y jouer un rôle significatif. C’est pourquoi le parcours professionnalisant CIMER est proposé à l’initiative de l’UFR d’Etudes slaves de l’Université Paris-Sorbonne, avec le concours d’enseignants slavistes, germanistes, historiens, historiens de l’art, mais aussi d’administrateurs et de conservateurs de musées. Il dispense ainsi un enseignement qui est assuré à la fois par des universitaires et par des professionnels qui exercent dans les milieux spécialisés. L’attention est centrée sur les questions de méthodologie liées à la connaissance et à la gestion des relations entre les cultures, les patrimoines matériels et immatériels, l’informatique, mais encore les stages (voir à cette rubrique). Dans chaque spécialité, une deuxième langue vivante est maintenue, pour que l’étudiant puisse approfondir ses connaissances – qu’il s’initie à une autre langue d’Europe centrale et orientale ou qu’il complète sa formation en allemand ou en anglais. Les séminaires et conférences ont lieu soit à l’Université soit dans les institutions culturelles elles-mêmes. Le « CIMER » s’adresse à des étudiants slavistes, germanistes, historiens ou historiens de l’art, qui connaissent bien une langue de la zone « Europe centrale et orientale » (allemand ou langue slave, en particulier le russe), ou bien souhaitent acquérir rapidement cette connaissance, afin de travailler au mieux dans les relations interculturelles entre les pays d’Europe centrale et orientale et l’Europe occidentale. Pour cela, ils doivent acquérir ou renforcer un savoir qui concerne les patrimoines (en perspective historique et dans le monde actuel), les politiques culturelles, les phénomènes de médiation, les questions de muséologie, les problèmes d’administration et de gestion. Ces étudiants doivent être déterminés à s’en donner les moyens grâce à une connaissance approfondie de 2 langues et des aires culturelles concernées ; un réel savoir-faire au plan de la documentation et de la rédaction ; la volonté de perfectionner leur connaissance concrète des moyens relevant des multi-médias ; une participation active, tant aux séminaires théoriques et pratiques qu’aux stages de terrain, en France ou/et à l’étranger. Les différents enseignements trouvent ainsi une application directe dans la réalisation d’un projet personnel et dans un stage, souhaitable en M1 et obligatoire en M2. Chaque promotion favorise des échanges fructueux au sein d’un Forum, qui va permettre aux étudiants et aux « anciens » d’interagir. Les secteurs professionnels sont significatifs à l’heure actuelle, en raison de l’entrée récente de plusieurs pays d’Europe centrale et balkanique dans l’Union européenne, mais aussi du vif intérêt que lui portent les pays de l’Europe orientale (Russie, Biélorussie, Ukraine).